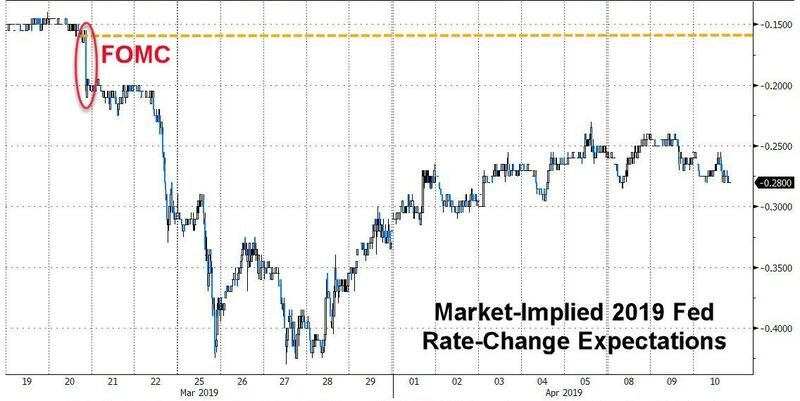 Alternative title: "FOMC Minutes show market is now in charge"
Recall the FOMC held rates steady, forecast no additional hikes this year and announced plans to end balance sheet shrinkage in September, and as Bloomberg reports, that led markets to price in interest rate cuts by next January. The minutes could push back against those expectations for actual cuts as the committee lays out conditions needed for a cut -- or a hike. Bloomberg Chief U.S. Economist Carl Riccadonna warned that "an important focal point of the minutes will be to determine the extent to which Fed officials expect the sources of recent economic weakness to be transitory. This, in turn, will signal how they might respond to signs of firming hiring, consumption and output ahead of the Fed’s next rate decision on May 1." 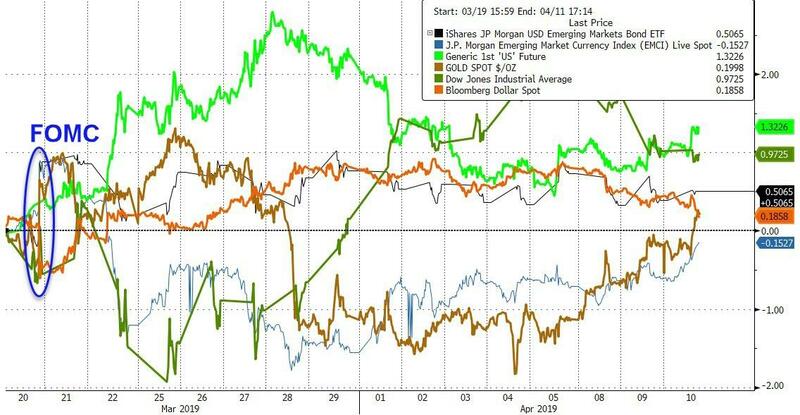 "With regard to the outlook for monetary policy beyond this meeting, a majority of participants expected that the evolution of the economic outlook and risks to the outlook would likely warrant leaving the target range unchanged for the remainder of the year." 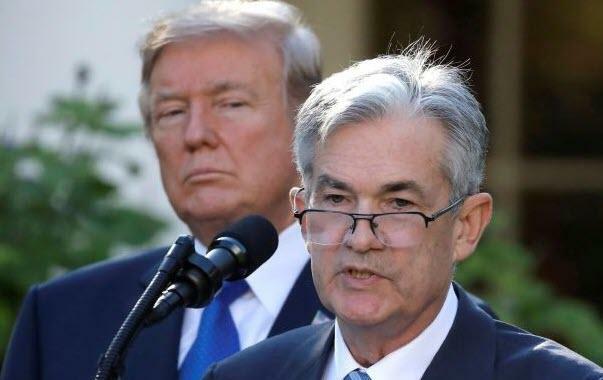 "Several participants noted that their views of the appropriate target range for the federal funds rate could shift in either direction based on incoming data and other developments. Some participants indicated that if the economy evolved as they currently expected, with economic growth above its longer-run trend rate, they would likely judge it appropriate to raise the target range for the federal funds rate modestly later this year"
"Several participants expressed concern that the yield curve for Treasury securities was now quite flat and noted that historical evidence suggested that an inverted yield curve could portend economic weakness"
"Several participants expressed concern that the yield curve for Treasury securities was now quite flat and noted that historical evidence suggested that an inverted yield curve could portend economic weakness..."
... however, their discussion also noted that the unusually low level of term premiums in longer-term interest rates made historical relationships a less reliable basis for assessing the implications of the recent behavior of the yield curve. "Several participants observed that the characterization of the Committee’s approach to monetary policy as ‘patient’ would need to be reviewed regularly as the economic outlook and uncertainties surrounding the outlook evolve." "A couple of participants noted that the ‘patient’ characterization should not be seen as limiting the Committee’s options for making policy adjustments when they are deemed appropriate." "Participants also discussed alternative interpretations of subdued inflation pressures in current economic circumstances and the associated policy implications." "Participants commented on a number of risks associated with their outlook for economic activity." "A few participants noted that there remained a high level of uncertainty associated with international developments, including ongoing trade talks and Brexit deliberations, although a couple of participants remarked that the risks of adverse outcomes were somewhat lower than in anuary." "Some participants suggested that, at future meetings, the Committee should discuss the potential benefits and costs of tools that might reduce reserve demand or support interest rate control." "Several participants pointed to the increased debt issuance and higher leverage of nonfinancial corporations as a development that warranted continued monitoring." "A few participants observed that an economic deterioration in the United States, if it occurred, might be amplified by significant debt service burdens for many firms." 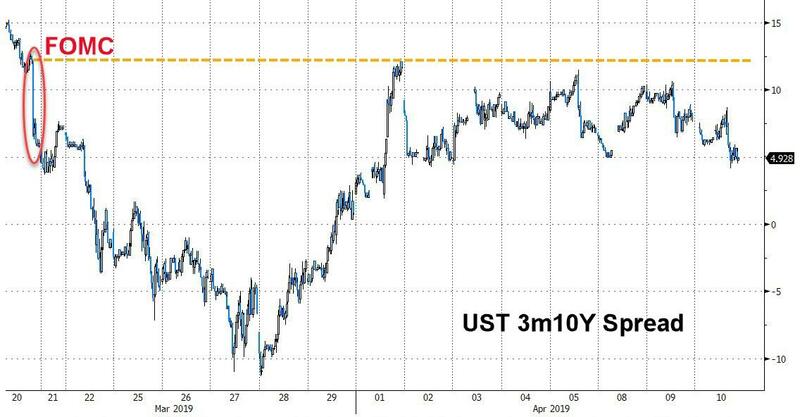 "Participants noted that asset valuations had recovered strongly and also discussed the decline that had occurred in recent months in yields on longer-term Treasury securities." "The Chair noted that he had asked the subcommittee on communications to consider ways to improve the information contained in the SEP and to improve communications regarding the role of the federal funds rate projections in the SEP as part of the policy process."